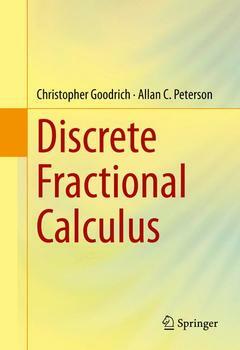 Discrete Fractional Calculus Goodrich Christopher, Peterson Allan C.
Auteurs : Goodrich Christopher, Peterson Allan C.
This text provides the first comprehensive treatment of the discrete fractional calculus. Experienced researchers will find the text useful as a reference for discrete fractional calculus and topics of current interest. Students who are interested in learning about discrete fractional calculus will find this text to provide a useful starting point. Several exercises are offered at the end of each chapter and select answers have been provided at the end of the book. The presentation of the content is designed to give ample flexibility for potential use in a myriad of courses and for independent study. The novel approach taken by the authors includes a simultaneous treatment of the fractional- and integer-order difference calculus (on a variety of time scales, including both the usual forward and backwards difference operators). The reader will acquire a solid foundation in the classical topics of the discrete calculus while being introduced to exciting recent developments, bringing them to the frontiers of the subject. Most chapters may be covered or omitted, depending upon the background of the student. For example, the text may be used as a primary reference in an introductory course for difference equations which also includes discrete fractional calculus. Chapters 1?2 provide a basic introduction to the delta calculus including fractional calculus on the set of integers. For courses where students already have background in elementary real analysis, Chapters 1?2 may be covered quickly and readers may then skip to Chapters 6?7 which present some basic results in fractional boundary value problems (FBVPs). Chapters 6?7 in conjunction with some of the current literature listed in the Bibliography can provide a basis for a seminar in the current theory of FBVPs. For a two-semester course, Chapters 1?5 may be covered in depth, providing a very thorough introduction to both the discrete fractional calculus as well as the integer-order calculus. Preface.- 1. Basic Difference Calculus.- 2. Discrete Delta Fractional Calculus and Laplace Transforms.- 3. Nabla Fractional Calculus.- 4. Quantum Calculus.- 5. Calculus on Mixed Time Scales.- 6. Fractional Boundary Value Problems.- 7. Nonlocal BVPs and the Discrete Fractional Calculus.-Solutions to Selected Problems.- Bibliography.- Index. Allan C. Peterson is professor of mathematics at the University of Nebraska, Lincoln. Peterson, with Walter Kelley, is author of "The Theory of Differential Equations", (c) 2010, Universitext. Current research interests include dynamic equations on time scales, fractional calculus, difference equations, and differential equations. Christopher Goodrich is currently a mathematics instructor at the Creighton Preparatory School in Omaha, Nebraska.